Ahlen, March 2013. – The Waldorf Astoria in New York is doubtlessly one of the most noted hotels in the world. Waldorf Astoria Hotels & Resorts has now opened its first branch in Germany. The 5-star establishment in Berlin’s West End stands in close proximity to the Kaiser Wilhelm Memorial Church and the Kurfürstendamm. For its interior, the luxury hotel required exclusive design and uncompromising quality, so it opted for Kaldewei’s Conoduo bath model to be fitted in its 200 bathrooms. High up on the 31st floor of the Waldorf Astoria Berlin, guests enjoy a sprawling view across the rooftops of Germany’s capital city and its Zoological Garden. Towering at around 118 metres, the building carries the name “Zoofenster” (Zoo Window) for good reason. Evidently modelled on its venerable parent establishment in the USA, the lobby is designed in elegant black marble and features a specially made Grandfather’s Clock. Homage is paid especially by the lobby’s centrepiece, the two-floor Peacock Alley. In New York, this corridor linked the originally separate buildings of the Waldorf Hotel and the neighbouring Astoria Hotel, merging the two into the famed Waldorf Astoria. In Berlin, too, the interior of the 5-star hotel with its 232 rooms and suites is defined by the art deco style of the Twenties and Thirties. Along with a ballroom and library, the hotel offers exquisite appointments such as Germany’s only Guerlain Spa. 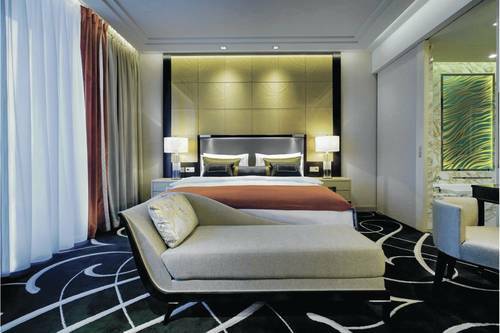 Premium product solutions are indispensable especially in a luxury hotel such as the Waldorf Astoria Berlin. They must look the part for years to come and ensure excellent quality. As a result, the 5-star hotel opted for Kaldewei to furnish its 200 bathrooms with the Conoduo bath model in Alpine White. Kaldewei’s Conoduo combines a linear expression of style with exceptional bathing comfort to blend harmoniously with the exquisite bathroom design of the Waldorf Astoria Berlin. With generous dimension of 180 x 80cm, the design award-winning bath from the Avantgarde collection provides ample room for the hotel guests to enjoy a relaxed bath, whether alone or for two – all Kaldewei “Duo” baths, after all, feature two comfortably sloping back rests and a central outlet and overflow. All Kaldewei baths, shower trays and enamelled shower surfaces are made of high-quality steel enamel. This material is robust to the point that it shows not even the slightest signs of wear despite years of use. Along with exceptional hygiene properties, Kaldewei steel enamel also excel in other aspects including quick and easy cleaning making chemical detergents expendable – a major advantage for housekeeping and the budget. But the Kaldewei baths in the Waldorf Astoria Berlin have another special feature in the form of anti-slip enamelling. This structured surface is made from a combination of quartz and sand which is burnt firmly into the steel, so the discreet anti-slip enamelling offers maximum safety underfoot no matter how much the bath is used. Recently opened, the Waldorf Astoria Berlin uniquely combines the myth of its parent establishment in New York with the vibrancy of a metropolis such as Berlin. Here, too, the interior of the 5-star hotel with its 232 rooms and suites is defined by the art deco style of the Twenties and Thirties. 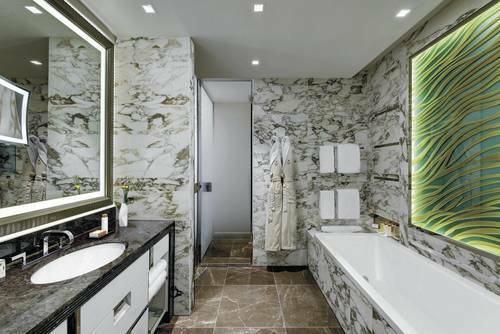 For its interior, the Waldorf Astoria Berlin opted for Kaldewei’s Conoduo bath model to be fitted in its 200 bathrooms. Kaldewei’s Conoduo combines a linear expression of style with exceptional bathing comfort to blend harmoniously with the exquisite bathroom design of the Waldorf Astoria Berlin. The Kaldewei baths in the 5-star hotel are additionally provided with anti-slip enamelling. 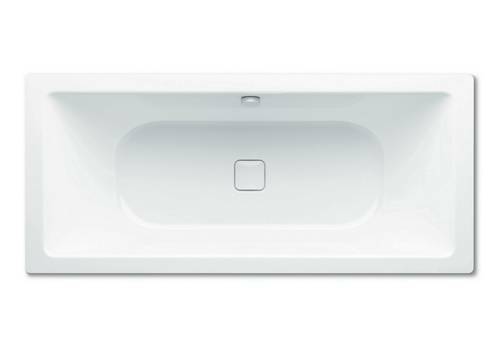 With generous dimension of 180 x 80cm, the Kaldewei Conoduo provides ample room for the hotel guests to enjoy a relaxed bath, whether alone or for two, thanks to two comfortably sloping back rests and a central outlet and overflow. The Conoduo has already received several design awards for its exclusive expression of style, including the red dot award.